The annual Treefort Music Festival returns to downtown Boise, ID from March 21-25 and the initial lineup has been revealed. 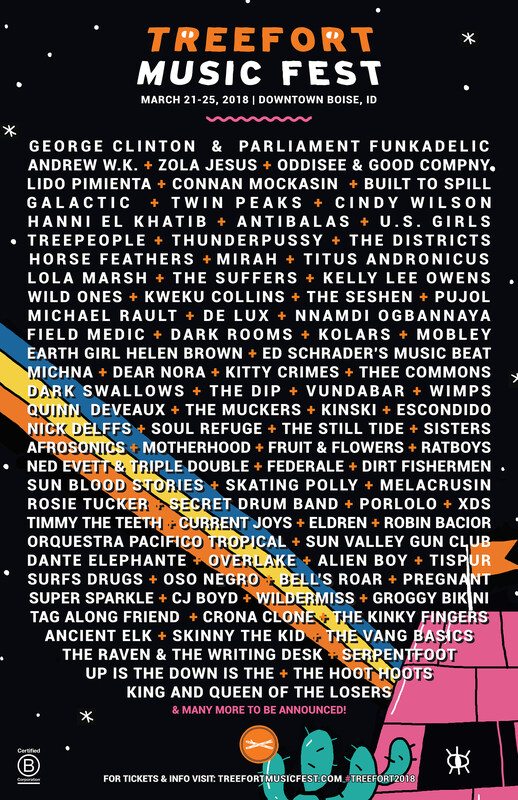 In addition to a Treepeople reunion and Built to Spill, it includes George Clinton & Parliament-Funkadelic, Andrew WK, Zola Jesus, Oddisee & Godd Compny, Lido Pimienta, Connan Mockasin, Built to Spill, Twin Peaks, Cyndi Wilson (of The B-52s), Hanni El Khatib, Antibalas, U.S. Girls, Mirah, Titus Andronicus, Kelly Lee Owens, Kweki Collins, Pujol, Dear Nora, and more. Tickets are on sale now. The full initial lineup and an announcement video are below.